It’s less than 20 days to my pre-wed shoot and I am totally feeling the stress man. As you may have realised.. I’m no longer doing insanity workout anymore! The main reason being I was getting knee pains from all the jumping around.. Seriously I think too shiong for my joints to handle or I’m not doing it correctly. Quite horrifyingly, I also put on weight with Insanity workout which made me quite sian! 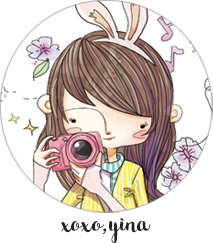 And with my photoshoot so near upon me.. I really desperately need to do something serious about losing weight. So.. I’m back at Slim Couture again!!! They’re honestly my best hope when it comes to losing weight. Cos the TCM sessions are really effective when it comes to losing the inches! I’m still amazed that I actually lost 33cm overall in terms of measurements last year, with Slim Couture. Despite not adhering strictly to their diet (I even went overseas to HK!) and all that! 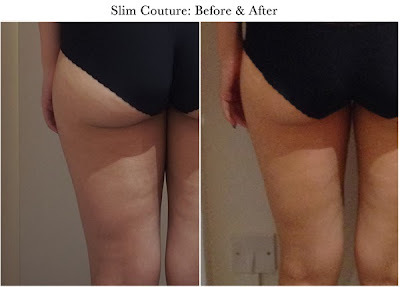 Some of the before-and-after photos taken last year, my silhouette was like so much improved after my sessions at Slim Couture? I’m still shocked at my bra fats man. So damn unsightly!! I think the gua sha really helped with reducing all the pockets of fat on my body! But unfortunately, due to all the Christmas and CNY stuffing myself plus the four overseas trips I’ve been since the start of this year, and also I attribute it to Insanity workout, I actually put on weight..
Quite sian about it cos I worked so hard to lose weight/get slimmer at Slim Couture. So when I went back about 2 weeks ago, I actually was dreading the measurements and weighing and photo-taking. Damn depressing one. But surprisingly, even though I put on some weight, my measurements and even photos didn’t look half as bad as the first time I went to Slim Couture. And that was two weeks ago! I haven’t really mentioned it before cos I wanted to wait a couple of weeks to see what the results would be like. But I’ve been going with Jess and two of us have been trying to keep each other in check. Jess and I have been going down for our weekly sessions together on Tuesdays and Fridays, luckily we stay quite near each other so we can share a cab down! Also, Slim Couture opened a new branch which is at Singapore Shopping Center, Doby Ghaut, a lot more convenient for me now! It’s just a short walk from the MRT, next to the Fish & Co Glasshouse! I bet you’re wondering how the results have been so far! 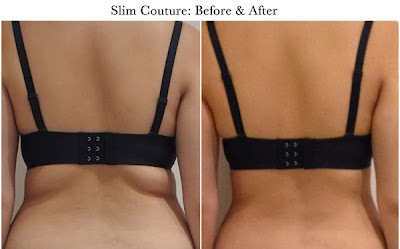 To be honest, I’m quite surprised because the measurements have been very consistently dropping every session, and it feels easier than the first time I did the treatment at Slim Couture! Joanne (one of the owners) says it’s cos my meridian points and all that are already more open and receptive since I already did the treatments before last year. For instance, when I started the Divine Slim treatments, my thighs were like 55cm. But today’s measurements were 51cm! 4cm in like 2-3 weeks is quite significant. Same for my waist.. Dropped 4cm already! Even my stubborn arms have also lost about 2cm each. And that’s only in about 6 sessions! It’s time to step up my game for the last burst before pre-wed shoot.. Another 20 days so I have like maybe 4-5 more sessions to go! Hopefully I can lose abit more in terms of measurements and weight before I fly to Korea on the 23th. If you’re keen to try a holistic and healthy weight loss treatment with Slim Couture… Now’s your chance to join me!! Better still… Slim Couture is running a weight loss challenge for all customers! We are motivating you to lose weight!! You will receive $40 cash rebate for every 1kg weight loss! No better motivator than money. Hahaha! Jess and I at Slim Couture!